A LaFerrari Aperta supercar just sold at a charity auction for a record €8.3 million ($10 million) -- the most money ever fetched by a 21st century vehicle. The sale was made at the Ferrari factory in Italy during a celebration for the automaker's 70th anniversary. The futuristic Aperta, which has yet to be assembled, sold Saturday for twice the amount auctioneers expected after a bidding war between at least 12 auction attendees, the auction house RM Sotheby's said in a press release. The buyer -- whose identity was not revealed -- saw nothing but a digital mockup of the finished product before making the purchase. Once completed, the Aperta will be sprayed with "one-of-a-kind stunning metallic" red paint. It'll also sport two white racing stripes along its body, while the interior will be trimmed with black leather, red stitching and black carbon fiber paneling. 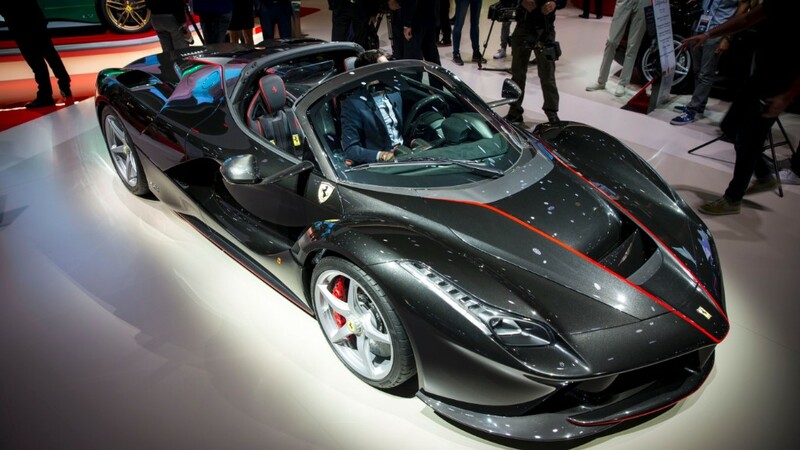 It'll be the 210th and last La Ferrari Aperta ever made. RM Sotheby's said of the Ferrari, "There has never been another vehicle as eagerly anticipated or as technologically advanced" throughout the carmaker's history. The car's entire $10 million sale price will be donated to Save the Children, an international youth education charity, RM Sotheby's said. While it is a record price tag for a car built after the year 2000, it should be noted that prices are typically higher when auction proceeds are intended for charity. --CNNMoney's Peter Valdes-Dapena contributed to this report.